Contains Glutathione, the body's master antioxidant. Medical studies show that Glutathione deficiency leads to acne. Taste's great! Mild peppermint flavor. Oral Acne Control? is taken by mouth and contains powerful antioxidants and nutrients that promote exceptionally healthy skin and prevent breakouts. Use Oral Acne Control? 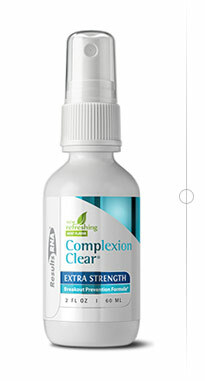 in combination with Complexion Clear? acne treatment pads and masque for the most effective skin clearing system available. Formula derived using a proprietary selective nutrient extraction process with ultra-distilled water, Peppermint Leaf (Mentha x piperita), Reduced Glutathione, Burdock Root (Arctium lappa), Soapwort Herb (Sopanaria officinalis), Agrimony Herb (Agrimonia cupatoria), Marigold Flower Petals (Calendula officinalis), Oregon Grape Root (Mahonia aquifolium) and Green Tea Leaf (Camellia sinesis), Advanced Cellular Silver 10 PPM.